, a clergyman of the Church of England, but whether belonging to the archbishop’s family is uncertain, was originally of the university of Cambridge, and was incorporated master of arts of Oxford, July 14, 1607. He was afterwards vicar of Cranbrooke in Kent, and minister of South wick in Hampshire. 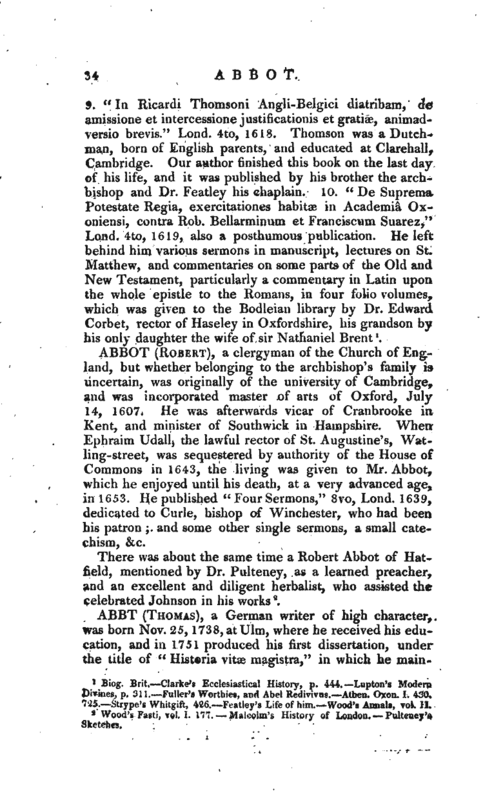 When Ephraim Udall, the lawful rector of St. Augustine’s, Watling-street, was sequestered by authority of the House of Commons in 1643, the living was given to Mr. Abbot, which he enjoyed until his death, at a very advanced age, in 1653. He published “Four Sermons,” 8vo, Lond. 1639, dedicated to Curie, bishop of Winchester, who had been his patron; and some other single sermons, a small catechism, &c.
Wood’s Fasti, vol. I. 177. —Malcolm’s History of London. —Pulteney’s Sketches.